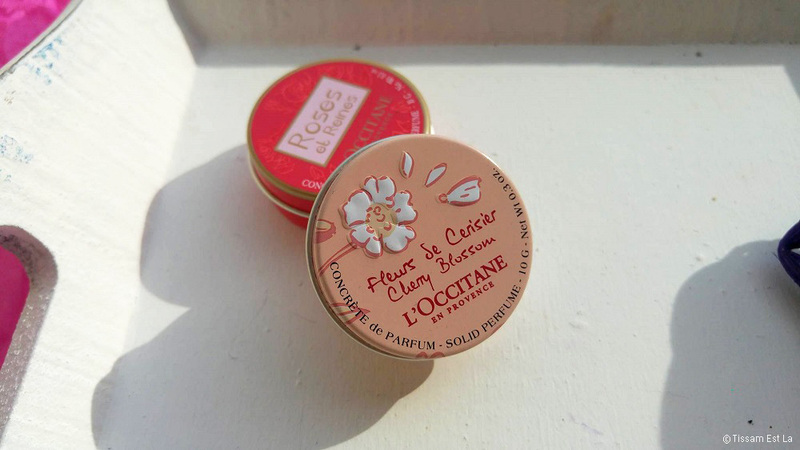 I'm a big fan of the brand L'Occitane because it is one of the first and only brands that have made me feel how delicate and delicious flowers could smell. I always think the way they work with flower scents in their handcreams, eaux de toilette and other cosmetics is admirable - which is why their Néroli & Orchidée eau de toilette is still at the top of my timeless wishlist. I don't know when I'll finally end up buying it : the problem is that I already have many, many body mists and I fear I won't be wearing it all that often whereas its price is slightly higher that any body mist I have so I wouldn't want to waste money. Meanwhile, I've found a very good alternative with two of the brand's Solid perfumes, Cherry Blossom and Roses et Reines. The good news is these perfumes cost only €10 each. There are 4 different scents if my memory serves me right : Roses et Reines, Cherry Blossom, L'Arlésienne and Thé Vert. 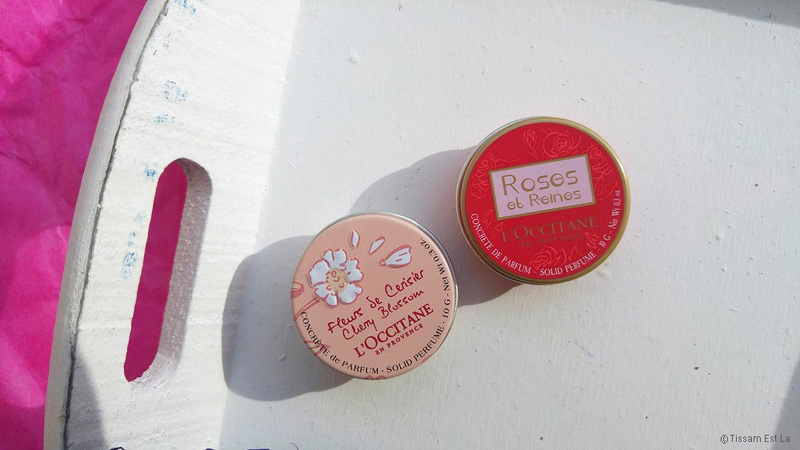 I see that there's only Roses et Reines left on the website so you should definitely go to a L'Occitane store to smell the other three - which is what I'd advise before any purchase on the Internet, by the way. 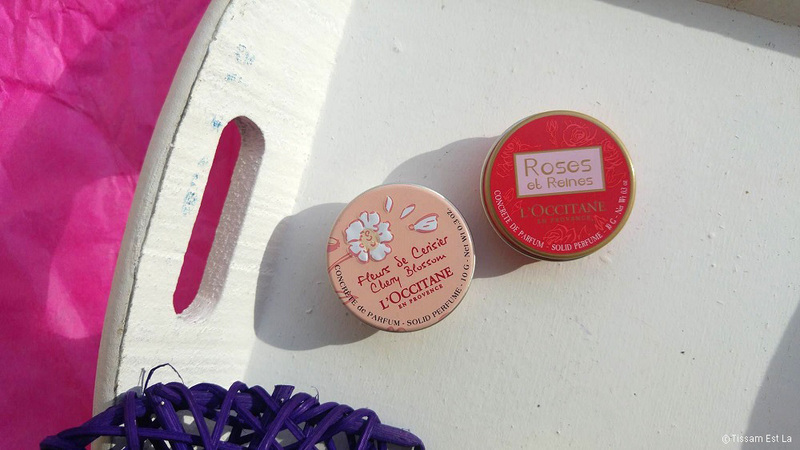 These perfumes are in take-along tins which are really cute and chic - I think they'd be perfect for a gift. All you have to do is open the tin, rub the surface of the perfume with your finger and apply perfume on your wrists, in your neck, behind your ears... Even though the product and the tin are really cute, it's not very hygienic given how easily it attracts dust and filth. They're slightly hydrating and there's no alcohol in the ingredients - I really like this more natural initiative from L'Occitane. This perfume was inspired by the four daughters of the Count of Forcalquier (a county in Provence in the South of France) who had each one favorite rose : Grasse, Morocco, Bulgaria and Turkey. Each of the got married to a king and so they became queens - their story was an inspiration for L'Occitane who made them their muses and so this perfume is a mix of the four roses. I like the story behind this collection of products and I really love this Rose perfume. 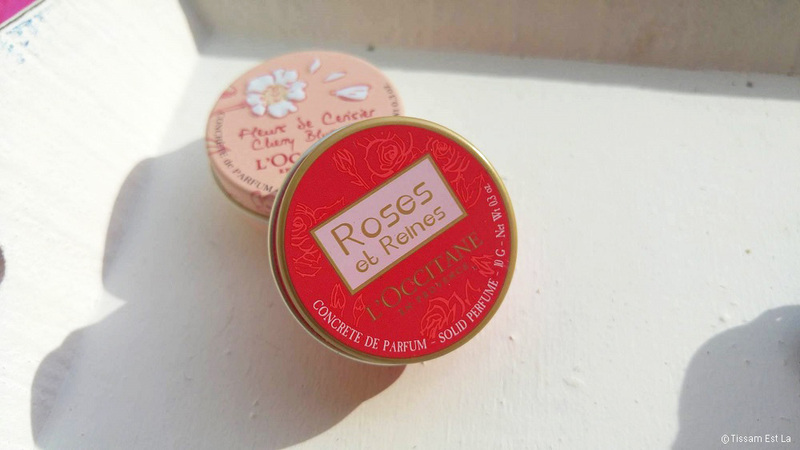 I also have the Roses et Reines handcream - I'm crazy about this scent. Even though the story behind the Cherry Blossom scent isn't as charming, it is still extremely delicate, even more than Roses et Reines is. It's subtle, very feminine, almost very young. While it's delicate, it isn't any more short-lived than Roses et Reines ; both last for about 2 to 3 hours. That's not very long but I expected it : these are perfumes that allow you to apply just a tiny amount to your skin, they move around a bit and they fade away with time as would any perfume. I certainly don't apply some more every two hours but I think that before a date, an interview or after a good shower, it's pretty great to feel cleaner and fresher with these on so I'm all for them. If they could release Néroli et Orchidée, I'd be even happier. Do you know these small perfumes ? What other solid perfumes would you recommend ? Let's keep traveling with amazing scents...! 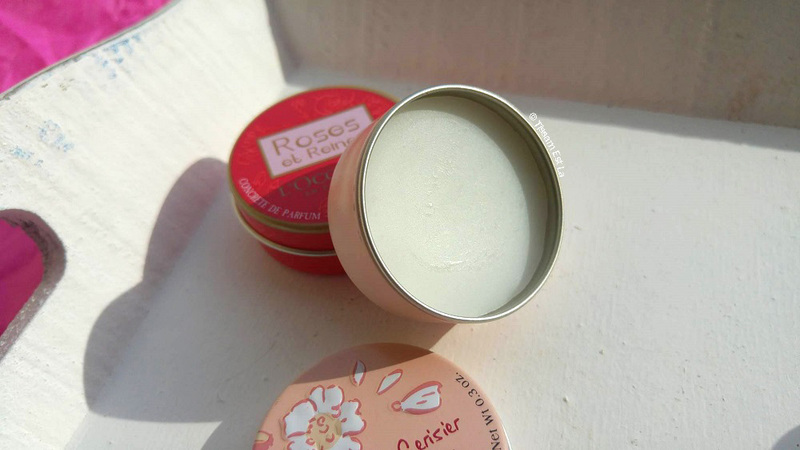 Natural and organic solid perfume ? 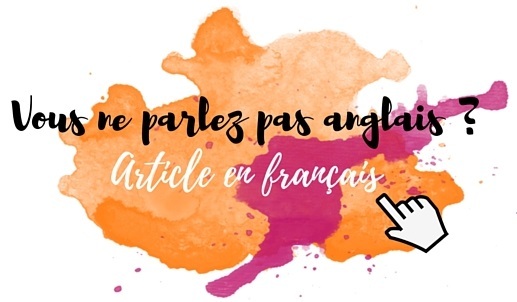 Téane did it !